Realm of Writing Korean Celt: Let's get physical. 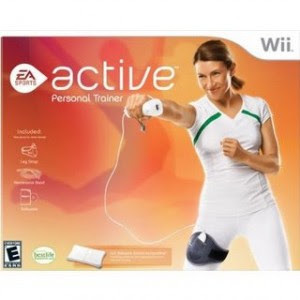 My brother gave me Wii Active for Christmas. I've been using it for a couple of weeks now and, overall, I like it pretty well. I like the preset workouts and I'm sweating at the end of a workout. However, I can already tell I'm starting to get bored with some of the workouts. It seems like the game repeats a lot of the same exercises and doesn't present anything significantly new. I do the game several times and week, and it's given a nice change to just doing the elliptical all the time, as I've done in the past. The main thing I wish I could do with it, that I haven't been able to see if I can, is alter the preset workouts. I like to work out a minimum of 30 minutes and a lot of the presets don't go that long, which kind of limits which work outs I choose. If I do pick one that's under half an hour, I do something like a Bender Ball workout afterward to push it up to at least 30 minutes, but I wish I could just add more exercises to what the game already has. The other thing that was kind of a bummer for me is the resistance band that came with the game wasn't very hard. It didn't provide enough resistance for me, so I switched it out for a Thera-band I had from physical therapy when I blew out my ACL. Now, it's fine, but I was just lucky to have something more powerful. I think I'm going to get the supplemental workout game. I also wish it had longer cardio routines. I'm realizing the longer I type, the more it sounds like I don't like it, but I do. I really do. You should check it out. This much fun should probably be illegal. Here's another preview. Here's another preview.